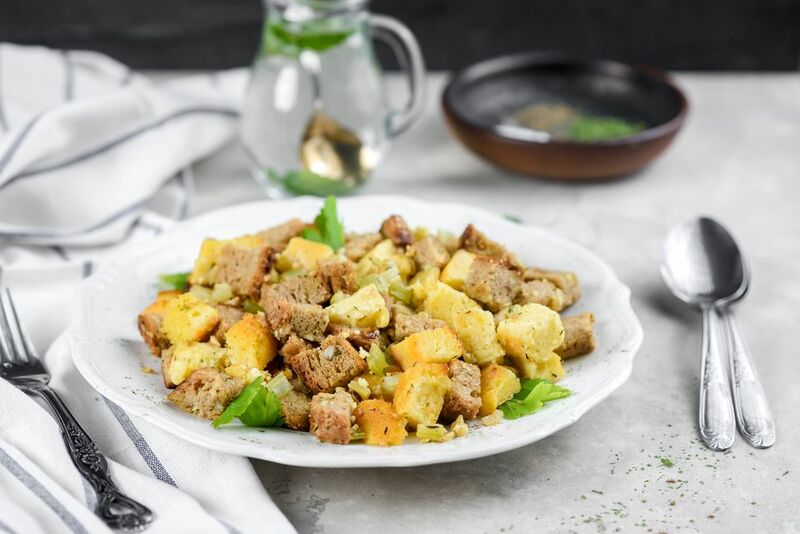 Cornbread stuffing (or dressing) is a Southern favorite served not only on Thanksgiving, Christmas or other holidays but also for any special family meal. This cornbread stuffing recipe is both vegetarian and vegan. You don't have to go without the traditional flavor just because you aren't roasting a bird. You'll first need to be sure to use a vegan cornbread, as typically most cornbreads would be made with milk, eggs, and butter. It may be easiest to make your own vegan cornbread to use as the starting point. This recipe also uses whole wheat bread, which you should also ensure is vegan. With those starting points, you will add your aromatics and herbs and vegetable broth. Now you can proudly serve your vegetarian cornbread stuffing along with the rest of your feast. But what will you serve it with? Here are vegetarian Thanksgiving main dish recipes to inspire you. Of course, there is Tofurky and other vegan turkey substitutes, including this recipe to make your own tofu turkey. If you're going to be a guest at a non-vegan gathering, you might offer to bring your own stuffing and other dishes along. Here are further tips on how how to be the perfect vegetarian Thanksgiving guest. Gather the ingredients and preheat the oven to 400 F.
Saute the onion and the celery in the vegetable oil for 3 to 5 minutes or just until almost soft. In a large mixing bowl, combine the sage, thyme, and parsley with the whole wheat bread and the vegan cornbread, mixing everything together well to combine. Add the sauteed onion and celery and stir to combine. Add in the vegetable broth just until the bread mixtures is lightly moistened, adding more or less vegetable broth as needed. Transfer to your prepared large casserole or baking dish and bake for 20 minutes. If you don't use spices very often, you may end up with years-old sage and thyme on your spice shelf. You'll get more flavor if you buy new spices every six months. Of course, you can also use fresh spices rather than those in the little bottles. Interestingly, fresh sage has a milder flavor than dried sage. Use about seven thin fresh sage leaves to substitute for 1/2 teaspoon of dried sage. If you want to use fresh thyme, use one fresh sprig to equal 1/2 teaspoon of dried thyme.